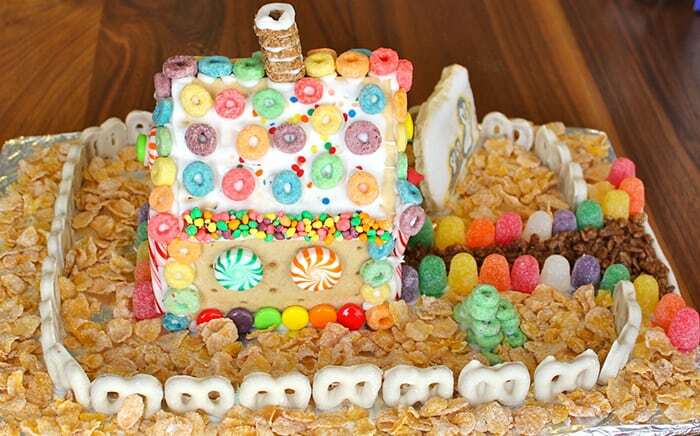 Every Christmas my daughter Scarlet and I celebrate the most special tradition: we make gingerbread houses, just the two of us. And every year they get more elaborate (e.g., two stories, guest house) and time consuming (all weekend). This year, for some reason, time just isn’t on our side. Between travel and family and parties we had to figure out a way to honor our tradition in a flash. 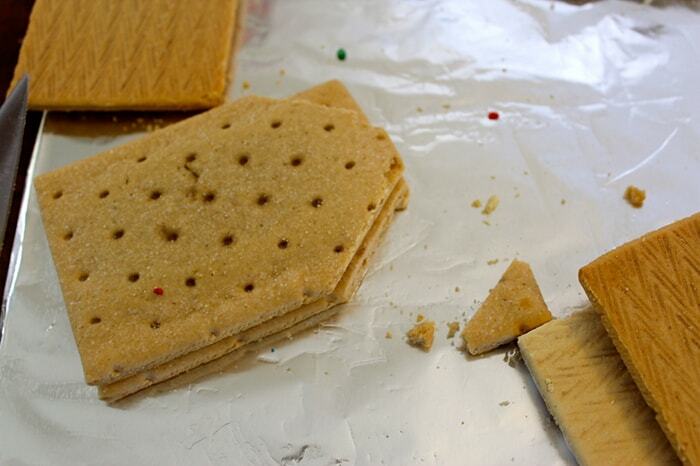 And that’s when the Christmas light bulb went off in my head: pop tarts! 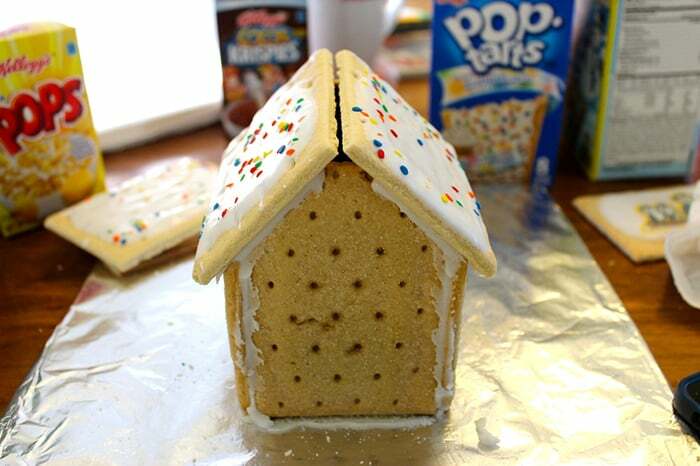 Pop tarts are perfect for ginger bread houses; they’re frosted and look like snow and thus make for the perfect roof. 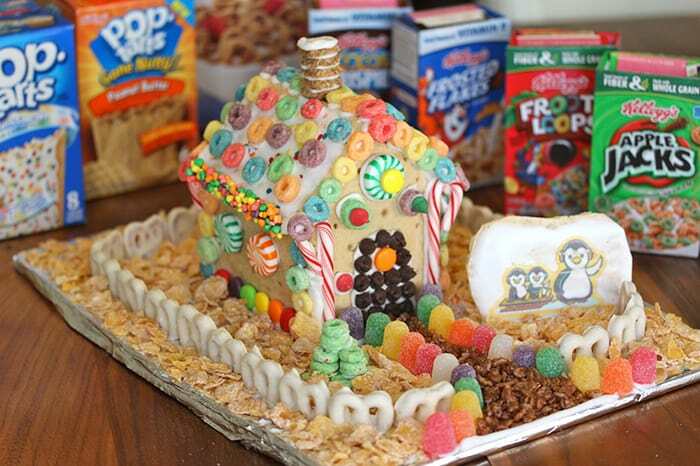 Then we used all types of Kellogg’s cereal we had in the pantry to decorate the house, yard, and sidewalk. 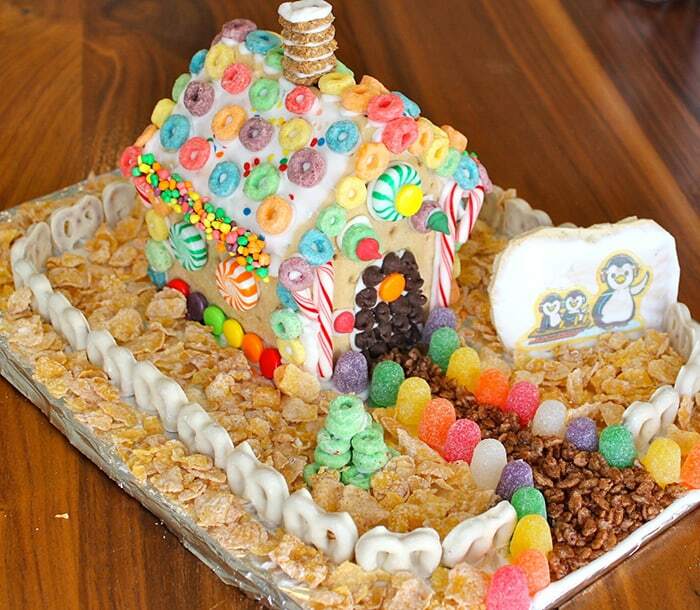 Not only was this our coolest gingerbread house yet, it was by far the most fun to eat. 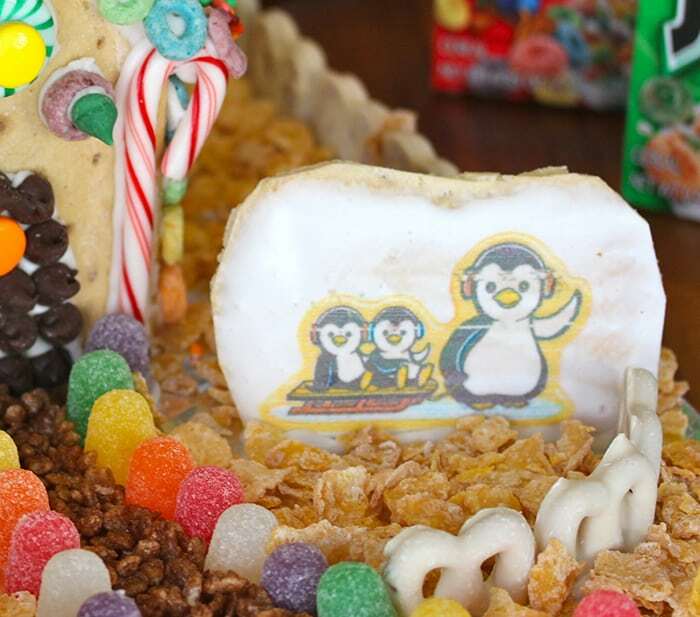 Pop-Tarts like Confetti cupcake for the roof and Peanut Butter for the walls, and I found the most adorable limited edition Sugar Cookie with images (see the penguin family!). Place ingredient in the bowl of a mixer and beat on medium high until thick and stiff peaks form, scrape down sides when necessary. Place into piping bag fitted with a small round tip or place in a plastic bag, seal closed and cut a very small piece off the corner. 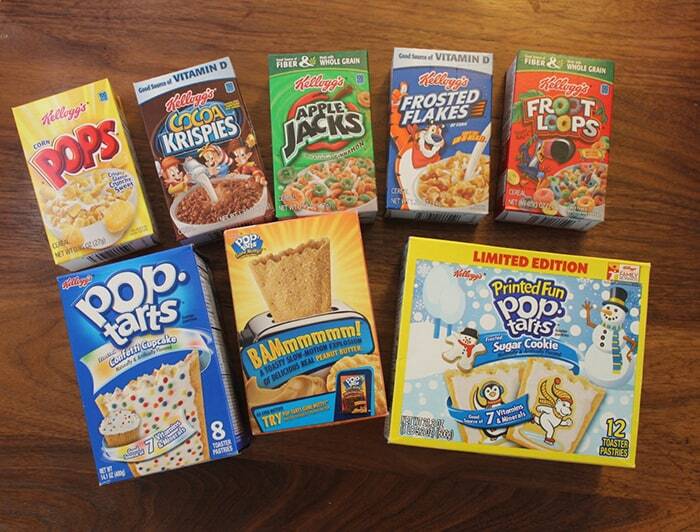 Kellogg’s Cereal like: Froot Loops, Apple Jacks, Cocoa Krispies, Frosted Flakes, and Cracklin’ Oat Bran. Candies like mini candy canes and other colorful, hard candies. Trim the top corners of the front and back walls. 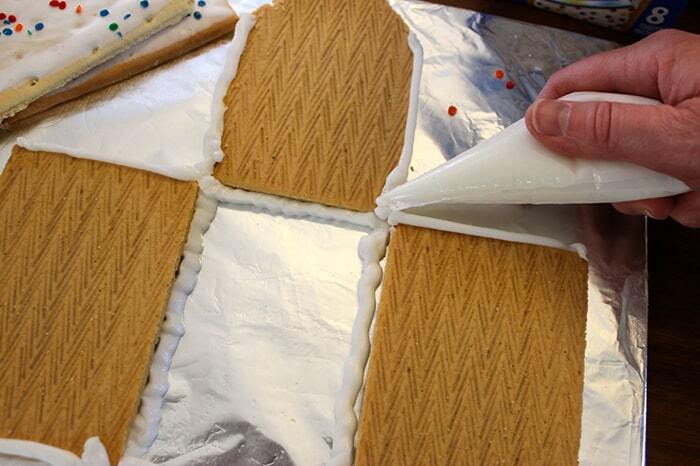 Lay the walls out and pipe the frosting along the edges like in the photo. Stand the walls up and press together. 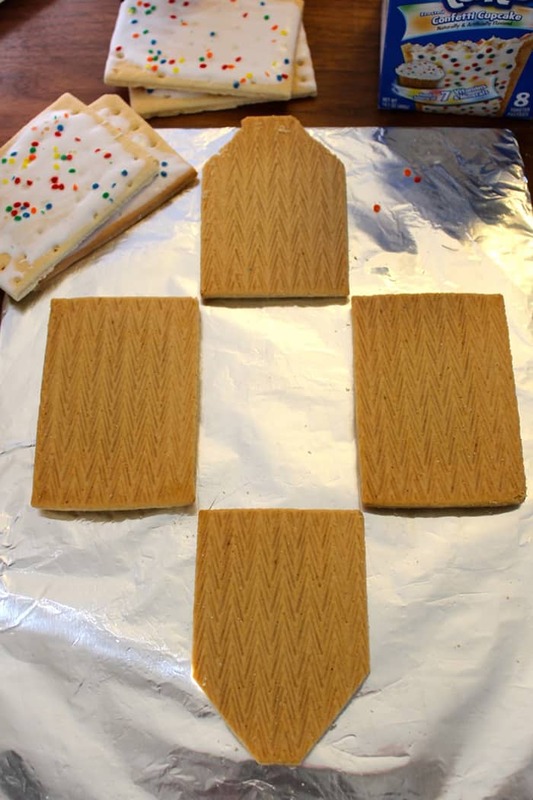 Place the roof pieces on. No need to worry about not matching up or gaps, those will be filled in with decorations. 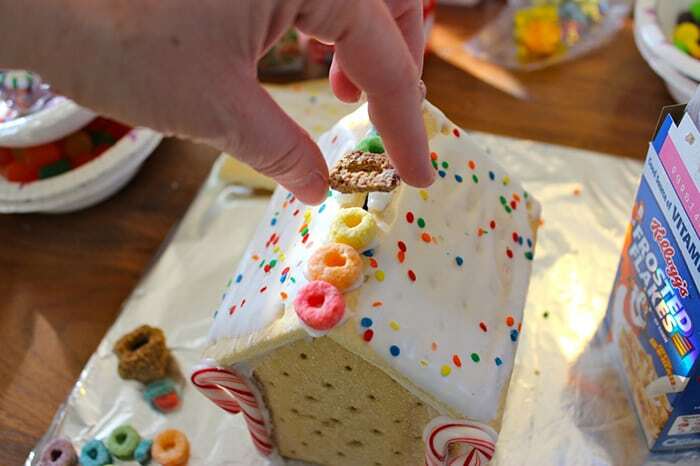 Pipe on frosting and decorate. 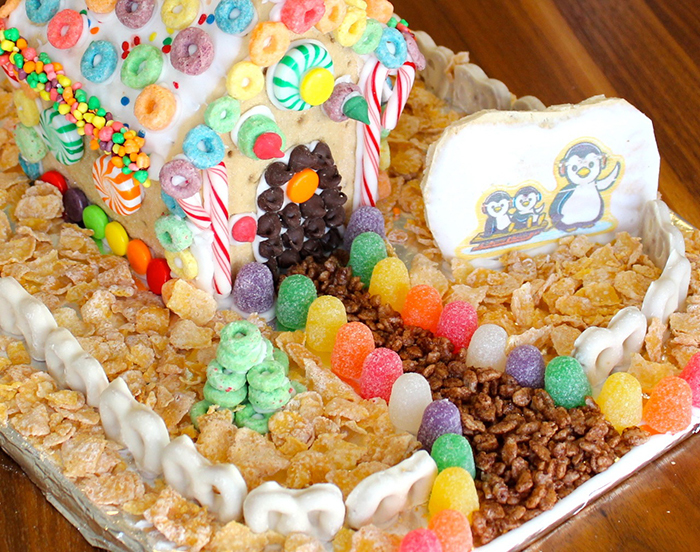 I line the roof with Froot Loops and made a chimney and back window out of Cracklin’Oat Bran. When the house was finished I cut the bottoms off of yogurt covered pretzels and glued them down to create a snow covered fence. For the yard I sprinkled Frosted Flakes and the walkway is Cocoa Krispies. The final touch is the Penguin family. I opened a few packages of Sugar Cookie Pop-Tarts and fell in love with the penguins. I trimmed it and glued it into place. 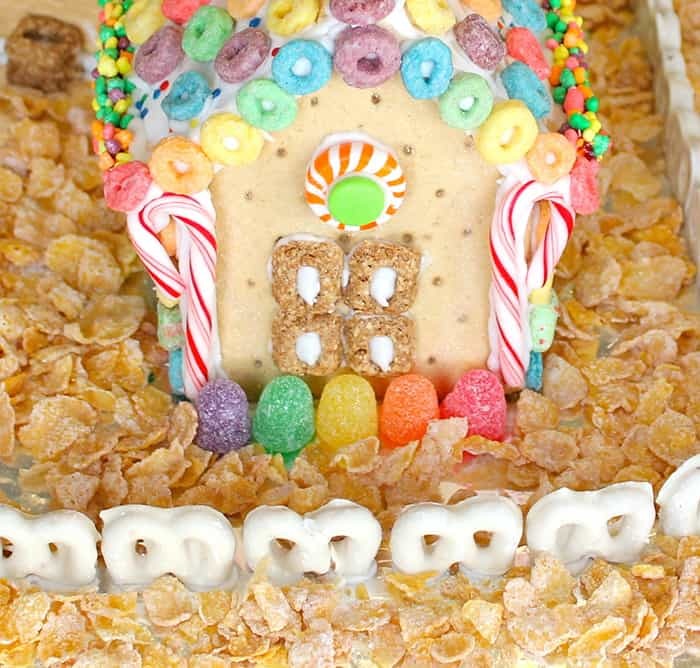 Here is our final and very festive Kellogg’s Pop-Tart Gingerbread house. My mouth is drooling! Love this idea! WOW! This is so cute! And I love that it uses mostly cereals! And the POP TARTS! Really genius! Merry Christmas! Such a fun season! 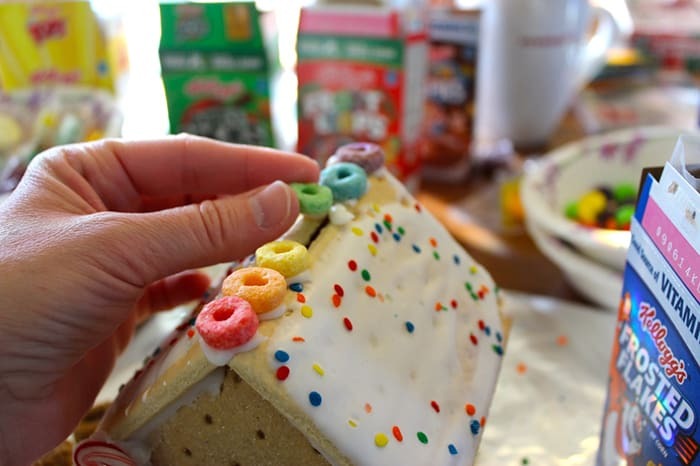 btw I had a friend who did not buy sweet cereals UNTIL Christmas…her kids could put the one they wanted on their “list” and it would arrive on Christmas morning wrapped up and special! your friend is a genius. BRILLIANT! 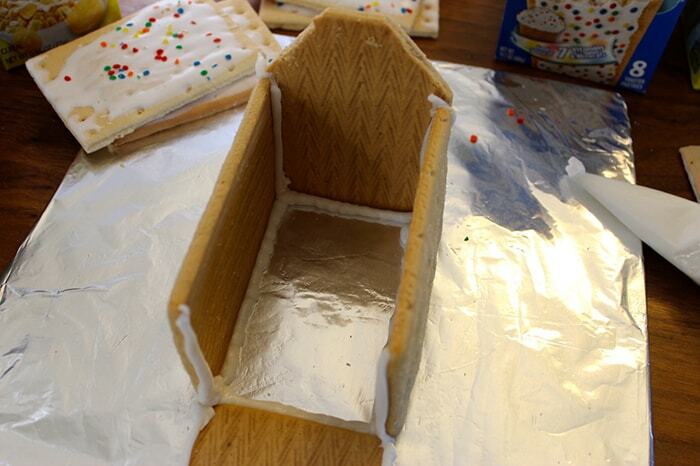 Already made our house this year, but will be copying this next year!